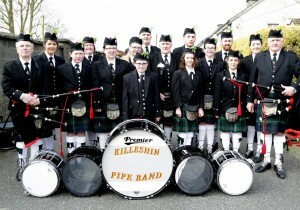 The Killeshin Pipe Band was set up in 1964. The reason for it’s formation was the band due to lead the May Sunday Holy Cross Sodality procession from Graiguecullen to Killeshin the year before failed to show up. Not to have this happen again a meeting was called to form a Pipe Band. It celebrated it’s 50th year in 2014 and Practice takes place two nights a week. New members always welcome. Tuesday and Saturday in Killeshin Community Centre.